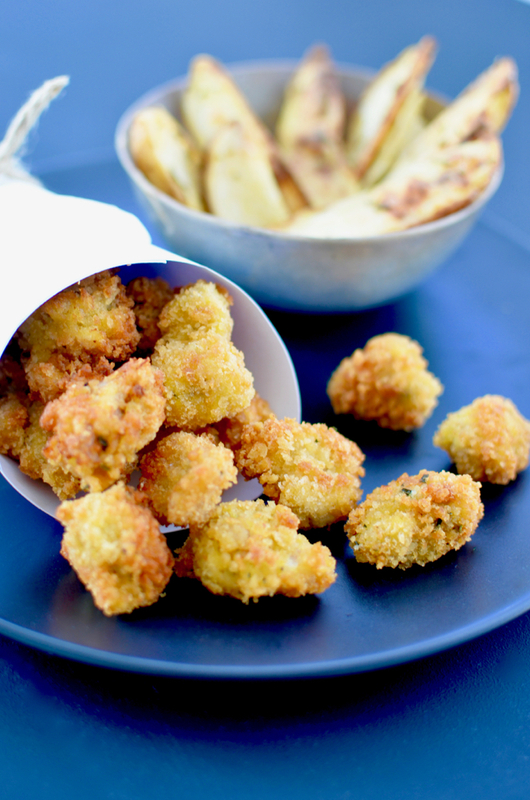 Ahh, popcorn chicken. It’s a classic for good reason. The kids love it. The grownups love it. It’s quick to make and when you do, you will be showered with more praise and adoration than if you’d slaved for five hours over a Michelin-star inspired degustation menu. It’s unfair to all the Michelin starred chefs of the world, but it’s true. 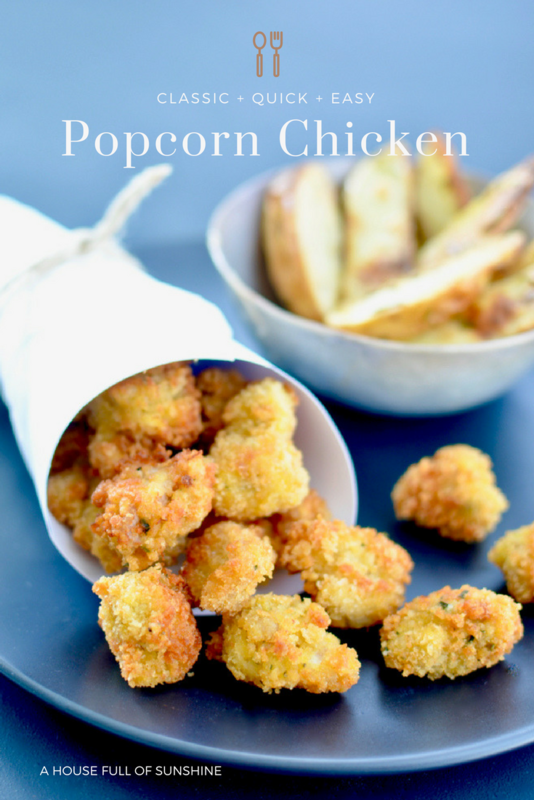 Your kids will like your popcorn chicken better. 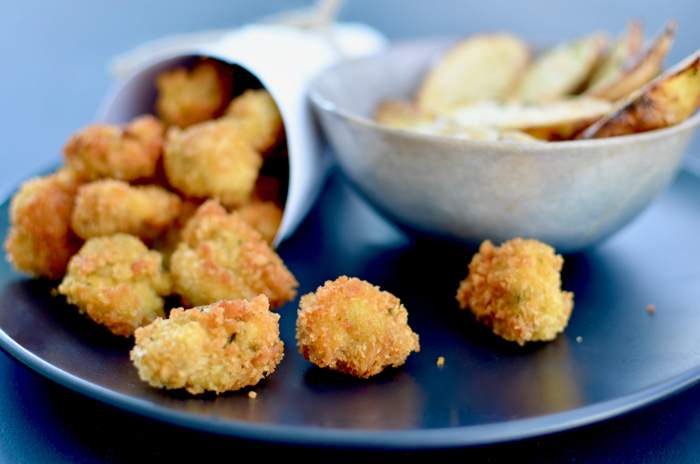 These golden little nuggets of goodness are made with a panko crumb for extra crunch, and served with home-made oven-baked potato and rosemary wedges. We had ours with a side of veggies… but these would also be nice with a garlic aoli dipping sauce, or a creamy rough-cut homemade coleslaw. Alright, I know your mouth is watering already, so let’s get to the recipe, shall we? Preheat the oven to 200℃ (400℉). 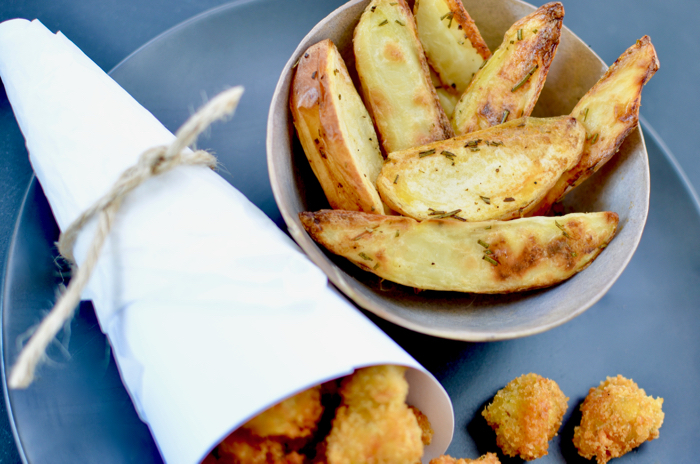 Slice the unpeeled potato into wedges and place on an oven tray lined with baking paper. Sprinkle with finely chopped rosemary, drizzle over 2 tbs of the olive oil and season with salt and pepper, then toss to coat. Bake for 25-30 minutes, or until golden. While the potatoes are cooking, dice the chicken into 1cm (1/2 inch) cubes. In a medium bowl, combine the plain flour, onion powder, dried parsley, mustard, and brown sugar. Season with salt and pepper. In a second bowl, whisk the eggs with a fork. In a third bowl, add the panko breadcrumbs. Dip the chicken in the seasoned flour, then in the egg, and finally in the breadcrumbs. Heat half an inch of oil in a large frypan, then fry the chicken for 5 mins or until golden and cooked through. 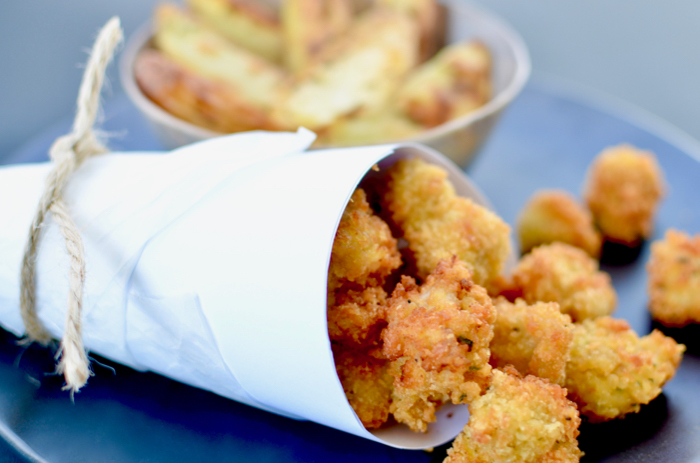 Drain on paper towels and serve with the oven-baked wedges. I hope you enjoy making this easy classic and get showered with appropriate love and adulation from your family. 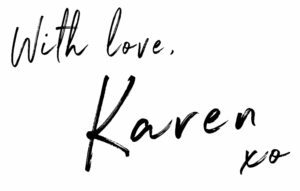 Make sure you pin it for when you need it! This recipe is adapted from HelloFresh – the subscription meal service that takes care of your menu planning and grocery shopping for you. If you like the idea of cooking crowd-pleasing meals like this from fresh, quality ingredients delivered right to your door, make sure you check out my review of HelloFresh here. The recipes are fantastic, the produce is amazing, and it’s given me a whole new love of cooking – with all the most boring and time-consuming bits taken out. Even better, I have a discount for Australian and U.S. readers on your first boxes. Click through for all the deets, and your coupon will automatically be applied. Wishing you a house full of sunshine and lots of yummy food! « Announcing… a new house build!